Jeffrey Wilson breaks new ground, adding "graphic interview" to the expanding categories of nonfiction comics and introducing Chomsky and his political thoughts to a new audience of readers. The term "nonfiction novel" was nonsense until Truman Capote coined it in 1965 to describe his book, In Cold Blood. "Nonfiction graphic novels" were still nonsense in 1991—until Art Spiegelman wrote to the New York Times asking why his best-selling, Pulitzer-winning Maus was listed under fiction: "I shudder to think how David Duke -- if he could read -- would respond to seeing a carefully researched work based closely on my father's memories of life in Hitler's Europe and in the death camps classified as fiction." When the Times printed Spiegelman's letter, it also moved Maus to its "hard-cover nonfiction" list, where it debuted at lucky number 13. In a sense, the literary genre of nonfiction comics debuted that day, too. Not only did graphic memoirs begin to appear in the Times' Book Review section, but so, too, did the even newer subgenre of graphic journalism pioneered most prominently by Joe Saco in the '90s. I was surprised at the time, but in retrospect it makes sense that a medium then defined by flying men in tights would need to leap across genre lines to earn literary attention. A quarter century later, nonfiction comics remain not only some of the most prominent in the field, but their range of "nonfiction" continues to expand too. With Jeffrey Wilson's The Instinct for Cooperation, as with Capote, "novel" doesn't mean fiction here, since Wilson's work is a well-researched, audio-recording-based merger of journalism and personal essay. Like Kate Evan's recent Threads, a first-person account of the refuge camps in northern France, Wilson casts himself as omniscient narrator leading readers through the tangents of his dialogue with the internationally renowned intellectual Noam Chomsky. The transcript-basis of the comic also reminds me of Eleanor Davis' recent, nonfiction-expanding You & a Bike & a Road, a drawn diary with a similar open-ended structure. Like Davis, Wilson had little control over his conversation once he pushed the "record" button. Of course, Wilson didn't decide to convert that conversation into graphic form until well after the interview, and his narration and chapter structure provides ample opportunities to escape Chomsky's office and wind down other visual paths. 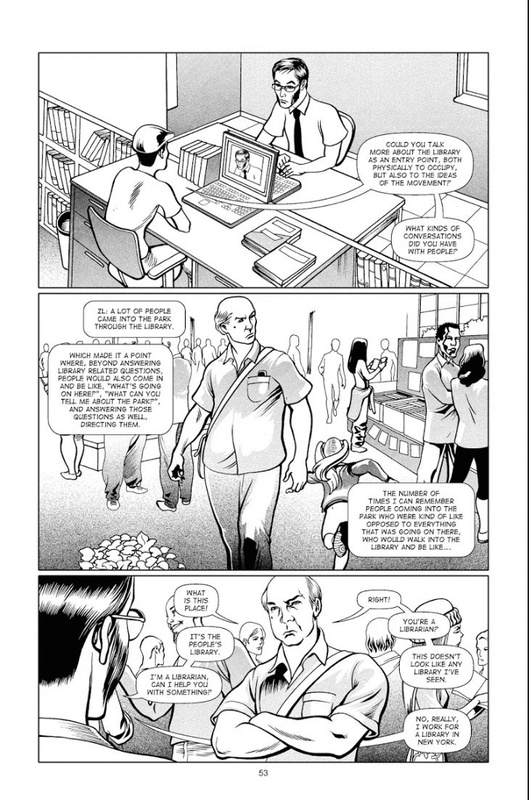 Although his comic-book self hits "record" on page five, Wilson's narrative voice is free to leap across countries and time periods, expanding on Chomsky's references but also initiating other conversations. Three of the seven chapters leave Chomsky entirely to interview other people: students and teachers in Tucson, Arizona; volunteer librarians in New York's Occupy Wall Street movement; an academic expert on student loan debt. It's a smart approach, providing a wider range of both information and dramatic situations. Wilson's biggest challenge is the visually undramatic nature of his content: two guys at a table talking. Artist Wally Wood famously addressed this challenge in his '70s-era how-to graphic: "22 Panels That Always Work!!! Or Some Interesting Ways to Get Some Variety into Those Boring Panels Where Some Dumb Writer Has a Bunch of Lame Characters Sitting Around and Talking for Page After Page!" Wilson's collaborating artist, Eliseu Gouveia, could add a few more to the list. 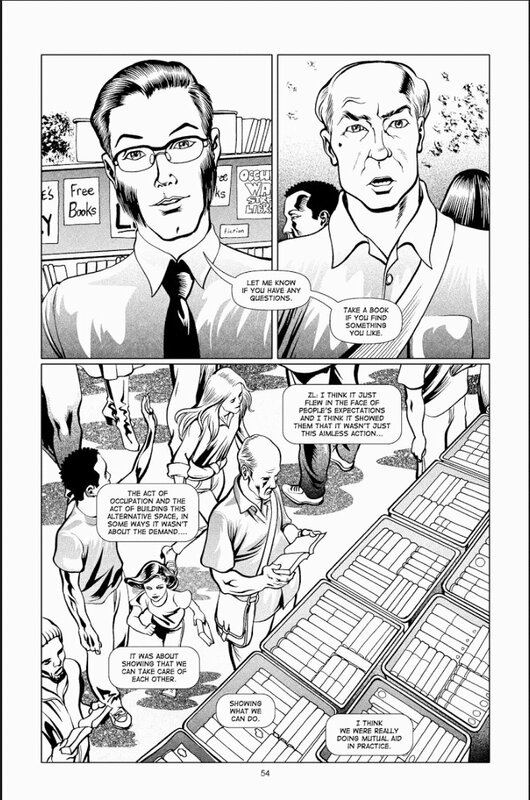 Gouveia's computer-generated, black and white images are composed of sharp lines and graytones, presented in a naturalistic style that lightly echoes superhero comics. He captures Chomsky's likeness well, but I had to read a page featuring the faces of Romney, Obama, Clinton, and Trump twice before recognizing the politicians, who go unnamed in the text. Wilson, who appears even more often than Chomsky, doesn't include an author photo of himself at the end. Though Gouveia's panels are predominately rectangular, he accents moments with tilts and overlays and the occasional frame-breaking flourish. The most visually engaging moments explore the physicality of Wilson's interviews. When he attempts to phone a former Occupy librarian, their figures face each other across a zigzagging gutter as their speech boxes are interrupted by a faulty connection. After they switch to Skype, their eye contact across the now straight lines of the gutter seems real, even though their locations are clearly unrelated—an effect ideally suited to the comics form. Wilson's conversations often center around the subject of spaces, how Occupy Wall Street both physically and organizationally structured itself in Zuccotti Park, combining a truly democratic system with the needs of, for example, a fully functioning library housed in plastic crates. I would have liked to see more visual interaction between the subject of such shared space and the literal page space, especially when the novel defaults to less engaging uses of words and images -- as when Gouveia draws a jet above a map of the US with an arrow indicating Wilson's flight from Arizona to Massachusetts or a picture of a protestor's hand-written agenda is followed by a picture of her stating, "Anything to add to the agenda?" It's impossible to know which visual choices are Gouveia's and which were specified in Wilson's script. Only Wilson's name appears on the cover and copyright, and Gouveia's "Illustrated by" credit on the title page falls under Wilson's larger and bolded "Written by". The Acknowledgements are Wilson's only, and though he thanks dozens of people, including his parents, letterer Jay Jacot, and the 107 crowdfunders who supported the project, he does not mention his co-creator. According to the one-sentence, back cover bio, Gouveia is Portuguese—and may have never met Wilson in person, while executing his scripts for a contracted fee. The arrangement wouldn't be unusual, though in a work about cooperative relationships, not addressing it might be. The crowdfunding campaign alluded to in the Acknowledgements also seems to suit the theme of the interview, how strangers with common political agendas instinctually coalesce to aid each other. While the partial omissions don't harm the graphic novel, it does seem Wilson may have ducked an opportunity to contextualize his work and link it more fully to his larger subject. The novel is a wandering report on Chomsky's thoughts on political organizing, initially focusing on Occupy, but soon veering to the Arizona legislature's dismantling of a high school's Latino studies program on the grounds that it promoted resentment against whites. The topic segues from New York's City's destruction of the Occupy library—the way actual conversations are prone to shift abruptly. Other shifts follow Wilson's line of questions, as when he prompts: "Professor, I would like to get your thoughts on the work being done post-Occupy? I've found especially inspiring the organizing around student loan debt with groups like Strike Debt and Rolling Jubilee." Both the segue and the diction are a little stilted, an oddity in a transcript-based novel. Did Wilson really say things like "Occupy is a very interesting example of mutual aid, but are there other historical examples of this spontaneity?" in his interview? or is his talk bubble speech overly condensed? Regardless, the leap from the Civil Rights protests in Greensboro, North Carolina and the armed uprisings in Barcelona in the '30s during the Spanish Civil War, to Chomsky likening Wilson's own student debt to "slavery" is jarring. I don't disagree with Wilson's advocacy, only its placement in the novel. Conversations are by their nature unstructured, but the graphic novel strives for a level of organization that at times feels torn between the norms of a graphic essay and the openness of a free-ranging discussion. 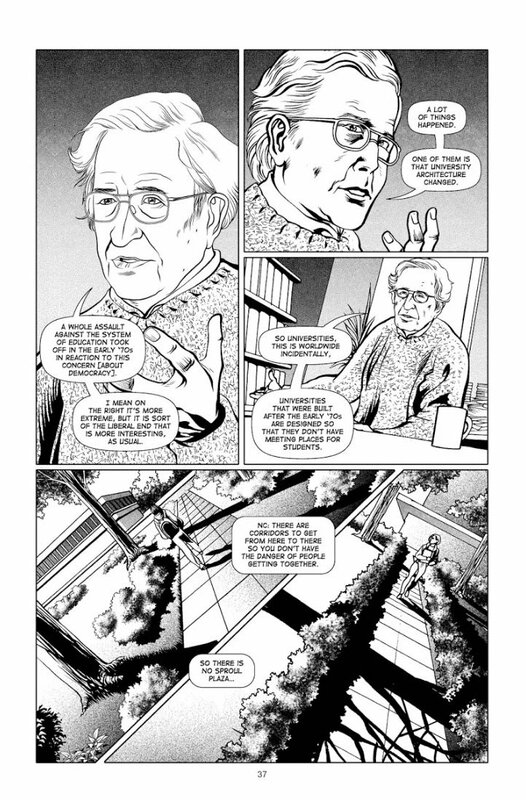 Still, Wilson breaks new ground, adding "graphic interview" to the expanding categories of nonfiction comics and introducing Chomsky and his political thoughts to a new audience of readers. Though The Instinct for Cooperation took Wilson several years to see into publication, I hope to see his next project sooner. 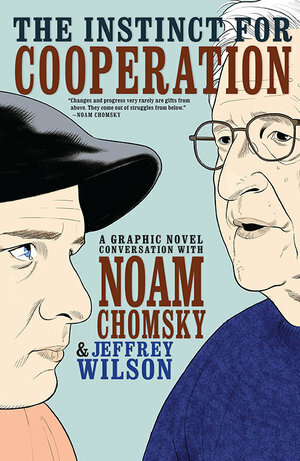 Genre-defying author Jeffrey Wilson discusses his ethnographic novel, The Instinct for Cooperation: A Graphic Novel Conversation with Noam Chomsky in this exclusive video.